At Modern Stone care we work with natural stone, such as granite, limestone, marble, slate, and travertine. All of these materials are porous and require specialized knowledge, paired with a delicate touch to properly clean and preserve their natural beauty. When natural stone is not properly cleaned, maintained, or is left unsealed it becomes vulnerable to absorbing stains and spills which will lead to damage. We know your natural stone was not cheap and we want to keep it looking amazing for as long as possible to protect your investment. Let us use our years of experience and knowledge to handle the complex nature of your natural stone. Granite is a gorgeous and popular option in homes, especially kitchens. It is not sensitive to acid like the calcareous stones such as marble, limestone and travertine are. We often still use alkaline cleaning solutions on granite because of the fact that alkaline cleaners emulsify dirt better than acids. If the granite floor has a sanded grout component, we often will clean the floor with an alkaline solution and then follow up with a second step in the cleaning procedure. Due to its acid sensitivity, limestone must be cleaned using an alkaline cleaning solution. We give the solution approximately 20 minutes of dwell time. This gives the cleaner time to emulsify the dirt that is embedded into the stone and grout. We then use an industry accepted spinner tool which provides pressure coupled with vacuum for extraction. 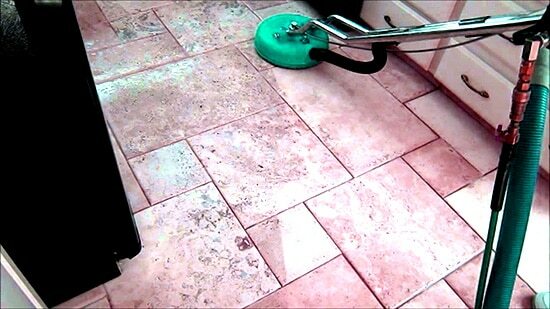 This process also removes dirt from the top of your grout lines. Marble is a elegant stone that is very popular in grand entrance ways, kitchens and more. Just like limestone, due to marble’s acid sensitivity, it must be cleaned using an alkaline cleaning solution. We let the solution sit for about 20 minutes, giving it the time to emulsify the dirt that is embedded into the stone and grout. We then use the same industry accepted spinner tool which provides pressure coupled with vacuum for deep extraction. Slate gives a modern clean and modern touch to homes and businesses. Due to the texture and graininess of this particular stone, a good amount of dirt can build up in its crevices. Generally, we will clean slate with an alkaline cleaning solution because it is the best at emulsifying dirt. We give the solution 20 minutes sitting on the stone. This gives the cleaner time to depolarize the dirt that is embedded into the stone. Travertine has become one of the most popular choices of natural stone in homes and businesses over the last decade due to it’s beauty and diverse uses. It is one of the more porous stones so requires a careful hand. Due to its acid sensitivity, travertine must be cleaned using an alkaline cleaning solution, that we let stay on the stone for about 20 minutes. This gives the cleaner time to depolarize the dirt that is embedded into the stone and grout. We then use an industry accepted spinner tool which provides pressure coupled with vacuum for extraction. Leave a job this important to the professionals at Modern Stone Care. We proudly serve The Greater Houston Area, including but not limited to Atascocita, Bellaire,Clear Lake, Cypress, Friendswood, Houston Heights, Houston, Humble, Katy, Kemah, League City, Kingwood, Memorial, Missouri City, Montgomery County, Spring, Spring Branch, Stafford, Sugar Land, Tomball and The Woodlands.